Lucy Campion, a ladies’ maid turned printer’s apprentice in 17th-century London, is crossing Holborn Bridge over the murky waters of the River Fleet one morning when, out of the mist, she sees a specter moving toward her. Frightened at first, Lucy soon realizes the otherworldly figure is in fact a young woman, clearly distraught and clad only in a blood-spattered white nightdress. Barely able to speak, the woman has no memory of who she is or what’s happened to her. The townspeople believe she’s possessed. But Lucy is concerned for the woman’s well-being and takes her to see a physician. When, shockingly, the woman is identified as the daughter of a nobleman, Lucy is asked to temporarily give up her bookselling duties to discreetly serve as the woman’s companion while she remains under the physician’s care. As the woman slowly recovers, she begins—with Lucy’s help—to reconstruct the terrible events that led her to Holborn Bridge that morning. But when it becomes clear the woman’s safety might still be at risk, Lucy becomes unwillingly privy to a plot with far-reaching social implications, and she’ll have to decide just how far she’s willing to go to protect the young woman in her care. Susanna Calkins has drawn a richly detailed portrait of a time in history and a young woman struggling against the bounds of her society in her next absorbing Lucy Campion mystery. 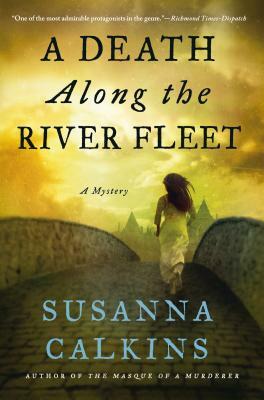 SUSANNA CALKINS became fascinated with seventeenth century England while pursuing her doctorate in British history and uses her fiction to explore this chaotic period. Originally from Philadelphia, Calkins now lives outside of Chicago with her husband and two sons. A Murder at Rosamund's Gate is her first novel.